Are you a student? Looking for work? We’re here to help you with your job search. A Resource Centre with computer, printer, fax machine and internet access as well as a range of employment related resources and information. Career exploration resources to help you identify your career goals. CPR, Service Excellence and Smart Serve Training, as well as, job search, interview and resume workshops. Help critiquing or developing your resume and cover letter, and help preparing you for an interview. Job leads, as well as referrals to employers that hire exclusively through EPC! If you’re a part-time student, you may be eligible for personalized One-on-One Employment Counselling. In school full time? Don’t worry. Counsellors are always on hand in our Resource Centre to help you with your job search, offering you the flexibility to come and go according to your busy schedule. 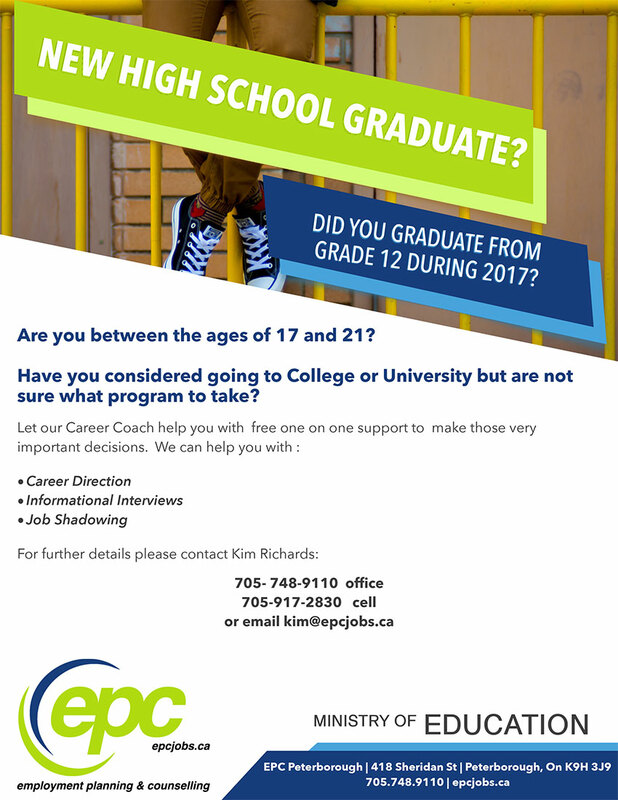 Visit or contact EPC today to speak with an Employment Counsellor or fill out your Job Search Profile online and we will contact you within one business day to suggest programs and services. To learn more, visit epcjobs.ca or call 705.748.9110 or visit the Resource Centre at 418 Sheridan Street Peterborough. The YJC-Summer program is for 15-18 year olds, students with intent of returning to school in the fall. 20 hours of paid pre-employment workshops and a work placement up to 8weeks.for more information and to schedule an intake individuals can call Mary at 705.748.9110 ext 241. Click here to download a copy of our flyer (PDF). Looking for a Summer Job? We have got them! Click here to look at the latest student job postings. Are You A High School Graduate Between the Ages of 17 and 21? Want to improve your French and earn money at the same time? The Summer-Work Student Exchange Program is aimed at 16 and 17 year old students looking to improve their French language skills. The Program is sponsored by the Federal Government and the local MP's Office. Students earn between $1300 and $1500 in the six-week program. Interested in the Ontario Summer Experience Program? The Summer Experience program offers jobs paying minimum wage for youth between 15 and 24 years of age (or up to 29 if disabled as defined under the Ontario Human Rights Code), working in critical government activities. The Ontario Internship Program offers two-year paid positions in a wide range of ministries and agencies across the Ontario Public Service. This entry-level program is open to people who have graduated with a recognized degree, post-diploma (graduate) certificate or a diploma within the past two years (May 2010 to August 2012). For more information check out the Ontario Internship Program (OIP)website. Curious about Youth Opportunities Ontario? Youth Opportunities Ontario is a website managed by the Provincial Government aimed at letting you know all of the options out there to help you reach your potential. Click here to 'learn more'. Take a moment to review the sections in this page for more information on our programs and services, or contact us directly! We’re happy to answer any of your questions.